Videos, examples, solutions, stories and songs to help Grade 4 students learn about division: how to divide 3-digit numbers by 1-digit numbers. This can be done by long division or short division. 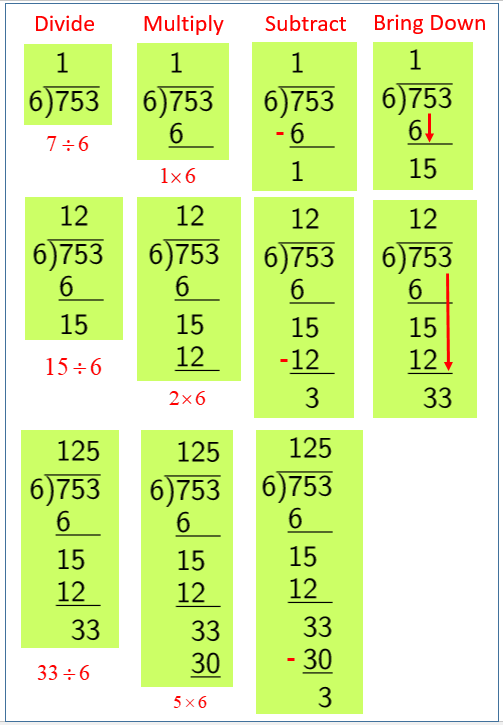 The following diagrams show the steps for long division: Divide, Multiply, Subtract, Bring Down. Scroll down the page for more examples and solutions. This video shows you how to do long division, using simple short steps. Learn the basics of how to divide. This is a typical long division problem for grade 4. The problem is 747 divided by 4. This video shows a solution using the standard long division algorithm. Always remember to "divide," "multiply," "subtract," and "bring down." Keep your place value columns straight. Divide, Multiply, Subtract, Compare, Bring Down. Short division is exactly what the name implies — a shorter way to divide. The mental process is actually no different from long division, but the written steps are. Short division also makes it easier to divide numbers mentally. Divide from left to right, and carry where needed. This video shows a series of short division problems and also shows how to check the answer by multiplying. Problems begin with easy examples like 48 divided by 2, and gets up to 1736 divided by 7. This is a fast paced review for someone who's already been introduced to short division.